The social media marketing platform Hootsuite made an important announcement about their YouTube integration and how they are making it easier to connect with video through Facebook, Twitter, and Instagram. This is a nice advance for the social media marketing tool’s feature set, as Hootsuite smartly adapted to the trend of video viewing on social media. The numbers say it all. Video is an integral part of the average internet user’s experience. 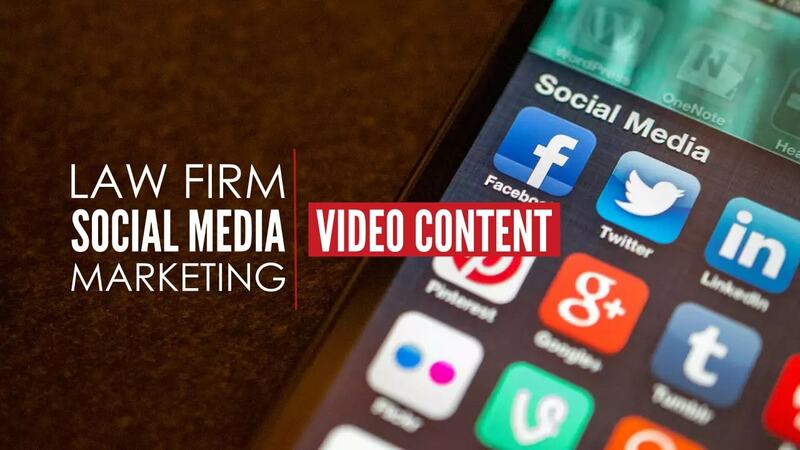 Your law firm’s social media marketing strategy has to include video if you’re going to reach your intended audiences, no matter who you are targeting. This begs the question: How do I use video for branding my law firm? You understand how important video is to social media marketing and your overall digital marketing strategy, and now the next task is figuring out how best to implement video so it represents your law offices and creates a better user experience for potential clients looking for your legal services. Here are three actionable ways for an attorney or law firm to create videos that will speak to your target audience, convey the nature of your practice, and make your law firm relatable to your potential clients on social media. A story told through video is like any other: It needs a relatable protagonist on a mission, obstacles for your character to face, a crisis point, and a resolution. Of course in a story used for marketing purposes the character’s goals and challenges will show consumers how the products or services you offer can make their life better. Video can potentially tell a bigger, better story about your company than text and images alone. While it’s true people spend a lot of time watching online videos, the chances of them spending a lot of time watching one particular video is slim. One of the keys to effective video storytelling, especially on social media, is to pack in all the information you want to convey in the shortest time frame possible. “Short” may mean 20 seconds or three minutes depending on what you’re marketing. Let your product, the intended viewer and how they’ll watch your video determine the length of your spot. Some businesses come up with brilliant digital marketing plans that attract a lot of attention through social media but communicating the purpose of their message is lost in the buzz. Don’t leave consumers watching your social media marketing video and thinking “Great, but how can they solve my problem?” Instead, create video content that clearly tells your audience what you can do to make their lives better. We can use a law firm as an example. This particular law firm is an LLP in Pasadena and many of their clients are in the greater Los Angeles area. They are expanding into Silicon Valley and want to use social media marketing to reach out to clients in places like Palo Alto and Mountain View. They post professional-quality videos to their social media accounts showing clients being helped by their lawyers with a narration about the legal problems they are specifically trained to assist with. This tells a simple, real story about their business purpose and how their services can improve the lives of their intended audience. And in this situation, the content is targeted at those new expansion areas in Silicon Valley. Whether your law firm specializes in criminal defense, civil litigation or intellectual property law, be sure your client knows you are the best choice for their particular legal matter. This tells a simple, real story about their business purpose and how their services can improve the lives of their intended audience. Part of relaying the purpose of your business is explaining who your customers are and who runs your business. There may be nothing more powerful than a video that says directly to your potential clients, “You are the person we are here to serve.” Video is also a great platform for showing what you and your management team are all about. Professional footage showing you and your team in action can leave your audience with a deep impression of the quality service you provide. Aren’t many people who hire an attorney interested in the favorable resolution of a court case? Or perhaps the prevention of litigation? Instill through video the confidence and expertise your law firm offers. You want the videos focusing on your areas of practice and your team of attorneys to be as professional as possible. But never forget the importance of humanizing your brand – that’s the key to connecting with your target audience. Homegrown videos have their place, too: when you want to give consumers a more personal insight into your brand. These videos are inexpensive, easy to shoot, and work well in the context of social media. This is also a way to let your staff’s creative talents shine by recruiting them to make videos you can post to your Facebook or Twitter account. Even something as simple as an attorney’s “behind the scenes” clip can be a way to engage consumers and show the personal side of what you do. Documentary-style, how-to, and personal story videos can be shot on a smartphone and used to expand the storytelling you begin with your professional videos. The voice of your firm’s brand, however, should remain consistent in all of your marketing materials, online and off. Whether that voice is humor, corporate, friendly, compassionate, edgy, etc., using video is the clearest way to communicate your brand. Follow Hootsuite’s lead. Let your social media management team know you need to make social media video marketing a top priority. Understand the statistics on online video viewing, put them into practice and you’ll open up a whole new way to tell the story of your law firm’s brand to the public. SafeHouse Web is Silicon Valley social media marketing company in Hollister, California, that provides expert WordPress website design, social media strategy, and proven SEO solutions. Email us at hello@safehouseweb.com or call (831) 205-0077.